Terrill D. Hall « joDah Ministries, Inc. 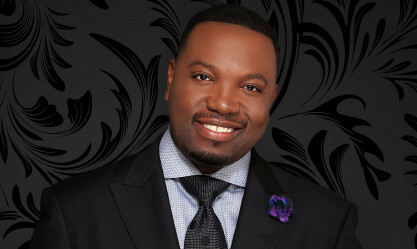 Known as one of the top ten finalists on BET’s season six hit gospel singing competition Sunday Best, Terrill Hall attributes his incredible voice as a Divine gift. Born and raised in Buffalo, New York, he always surrounded himself with different forms of music that ultimately exposed him to various genres that positively influenced his musical development. Terrill has not only been blessed to share his gifts locally in the Washington DC area, but he has also been blessed to share the stage with several gospel artists such as Kim Burrell, Donnie McClurkin, Karen Clark- Sheard and other renowned gospel artists. His passion for music excellence and his obedience to God's calling is leading him to pursue a singing career on a national level. Terrill's prayer is to be a vessel used by God to bring about deliverance and restoration in the lives of many through the ministry of music, regardless of denomination, race, geography or ethnicity. Terrill is working to produce his first single as part of a larger CD release. He is soliciting your financial support to make this dream a reality. For more information on how you can support Terrill’s ministry, please contact him at: [email protected].